Ask any longtime Twitter user for their opinion on Twitter apps, and you’ll probably get your ear talked off. For a service that is very simple on the surface, there are a surprising number of ways that you can interact with Twitter, and every app handles things differently. Osfoora and its iPad version, Osfoora HD, aim to give you access to all of Twitter’s features, while maintaining a clean and simple experience. The apps are largely successful, but fall short in a few places. Every Twitter app contains a basic set of core features: reading the timeline, replying, and viewing direct messages. Beyond that, most current apps allow you to search for keywords, and view your lists and your favorites. Even with those areas covered, there are many more ways to interact with Twitter, and Osfoora gives you access to almost all of them. From editing your profile, to viewing nearby tweets on a map, if Twitter offers access to a capability, Osfoora probably suports it. The key to giving access to this much information is how it’s presented. Who’s Tweeting Who: Osfoora makes it easy to tab between your timeline, mentions, and direct messages on the iPhone version of the app. 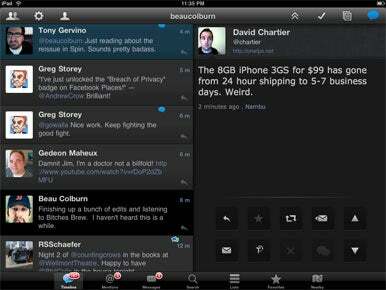 The basic design elements for Osfoora are the same on both the iPhone and iPad versions of the Twitter client. This consistency proves to be an advantage if you use both iOS devices. The top menu bar shows you the active account (you can tap to activate another account, if you have multiple ones set up), and the bottom tab bar is broken up into the main sections—Timeline, Mentions, Direct Messages, and Search. On the iPad, the larger screen also provides room for Lists, Favorites, and Nearby sections. That leaves the majority of your screen for scrolling and viewing your timeline. Scrolling is quick and smooth, and you can refresh the timeline via the “pull down to refresh” action that was first popularized in Tweetie (now Twitter for iPhone). Osfoora clearly presents retweets, with the original sender’s avatar showing up in the timeline along with a small line at the bottom of the tweet showing who it was retweeted by. Composing tweets brings up a similar window on both devices. Osfoora features a familiar 140-character countdown in the corner, to let you know you’re within your posting limit, along with a row of icons on the bottom of the window. These icons allow for common actions like adding photos or video to your tweet, shortening links, and tagging your location. Osfoora also gives you the ability to tag the current song playing in your iPod app, select someone from your Twitter contact list to mention, or search hashtags you want included. Again, if there is a bit of information you hope to include in your tweet, you can probably access if from Osfoora’s compose window. View to a Tweet: The basic design elements for Osfoora are the same whether you use the iPhone or iPad versions of the Twitter client. But the latter takes advantage of the larger screen to fit more tabs in along the bottom. While Osfoora’s basic elements are similar on the iPhone and iPad, the iPad’s larger screen and ability to switch orientation modes allows Osfoora HD to introduce additional viewing options. However, they also introduce some usability issues. When using Osfoora HD in portrait mode, tapping on a tweet in the timeline expands the top the top third of the screen into a blown-up view of the selected tweet. The rest of the timeline is still tappable and scrollable below. When you turn the iPad to landscape view, your timeline takes up the whole width of the screen by default. There is a split view mode that you can turn on in the app’s settings dividing the screen in half, with the timeline filling the left, and a blown-up view of the individual tweet on the right. This view makes it easy to quickly thumb through the timeline. Unfortunately, the multiple view options have some inconsistencies. For example, being able to view a conversation—a chain of Twitter replies—is an important feature. Osfoora HD marks conversations with a blue conversation bubble, which will open a popover containing the conversation when tapped. When you view your timeline in landscape mode, without the split view, this conversation bubble appears, but does nothing when you tap it. You need to turn on the split view for the bubble to have any function. Having the button only appear when it is tappable would help eliminate any confusion. There are a number of other small interface issues that become noticeable with more use: Close and Edit boxes are in different locations on different windows, certain windows that you expect to be popovers are actually modal and require a Close button to be tapped. Lastly, Osfoora integrates with Instapaper and Read It Later, which is a key function in an Twitter client. However, when turned on, selecting a link prompts you to add it to Instapaper before the link loads in the browser. Sure, you can also send it to Instapaper from the browser, but that extra step interrupts the flow. This action is the same on the iPhone and iPad, but like most of these small issues, they appear more noticeable on the iPad’s larger surface. Still, not every user will be bothered by these relatively minor issues which can certainly be corrected in future updates. Many people say that the best feature of the iPad is its ability to melt away into the background and allow you to become absorbed by an app. Ideally, a Twitter app will do the same. If you’re willing to sacrifice a few features, there are other apps where you’ll be less likely to bump into interface inconsistencies. Osfoora is a full featured app on both the iPhone and the iPad; there’s not much it doesn’t do. 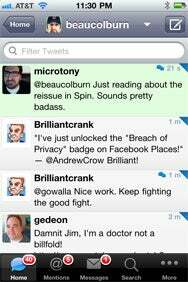 Everyone interacts with Twitter differently, and if an app that does almost everything is what you’re looking for, Osfoora is a solid choice.